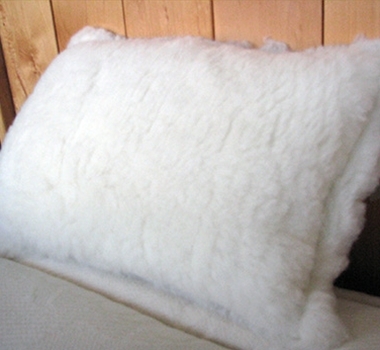 The top of this pillow is made of super soft Happy Lamb Fleece with a backing of wool textile. Extra stuffed for extra comfort. This pillow is part of the ReKindle Program, utilizing “tiny resources” left over to make upcycled products. The Happy Lamb Fleece top is from the topper production of this same line of items, while the wool textile backing is from the Moisture Barrier production line. Wool Weight: approx. 9 oz. Policy: Holy Lamb Organics products are custom-made to order. For this reason, cancellations are not allowed once an order is being processed and no changes are allowed to orders 3 days after order is placed. Any returns must get a pre-approval and a return authorization code. Please contact us at customerservice@theultimategreenstore.com for return authorization. Please be aware that there is a 20% restocking fee for all returned items. Items are returnable as long as they have not been used or laundered and it is within 30 days since receipt of goods. There are no returns on custom orders or private labels. Defective items are returnable within 10 days of receiving order if it has not been used or laundered.